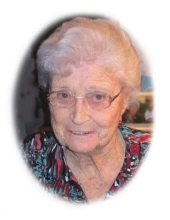 Funeral services for Doris Marie Johnson Gage, 94, of Pritchett will be 2:00 p.m. Thursday, February 7, 2019, at the Croley Funeral Home Chapel in Gilmer with Mr. Jack Wilkie officiating. Burial will follow at Pleasant Hill Cemetery. The family will receive friends Wednesday evening from 5:00 until 8:00 p.m. at the funeral home. Mrs. Gage passed away Monday, February 4, 2019, at her home in Pritchett. Mrs. Gage was born November 9, 1924 in Shady Grove to the late Leon Johnson and Jettye Pearl Hail Johnson. Doris worked with her husband in their home building business and did carpentry, roofing and flooring right alongside him. Mrs. Gage was and independent, confident and well respected woman. She was the matriarch of her family. She was a devout Christian and faithful member of the Pritchett Church of Christ. Doris enjoyed being outdoors, hunting, fishing, sporting events, traveling and spending time with family and friends. Mrs. Gage was a very selfless and always put others needs first. She will forever be remembered by all the loving family and friends she leaves behind. She is survived by her son Bobby Rex Gage and wife Shirley of Pritchett; two daughters Betty Sperier of Pritchett and Brenda Hill of Longview; sister Mary Jo Gosdin and husband Calvin; nine grandchildren; twelve great grandchildren; sixteen great great grandchildren as well as many other loving family and friends. Mrs. Gage is preceded in death by her parents, husband of 59 years Monaque Gage who passed away April 25, 2000 and three brothers Wayne Johnson, Joel Johnson and Elvyn Johnson. To send flowers or a remembrance gift to the family of Doris Marie (Johnson) Gage, please visit our Tribute Store. "Email Address" would like to share the life celebration of Doris Marie (Johnson) Gage. Click on the "link" to go to share a favorite memory or leave a condolence message for the family.